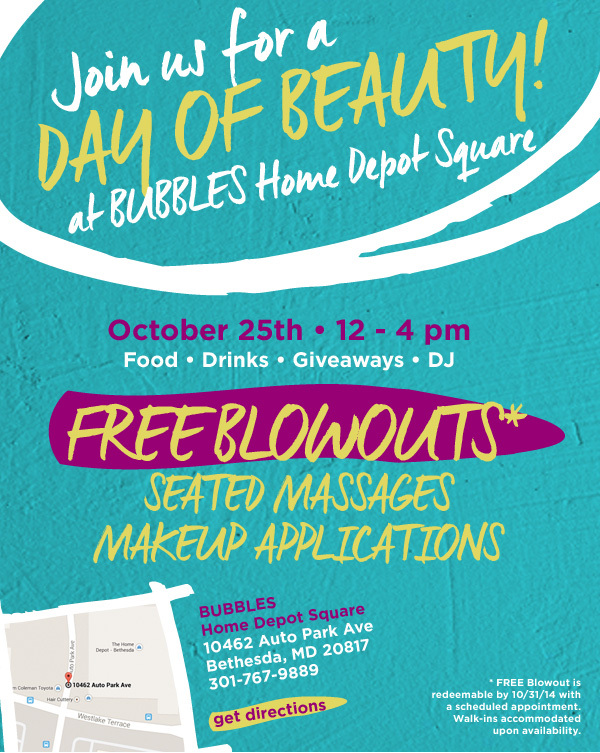 Get all dolled up tomorrow Saturday October 25 from 12-4pm at the Bubbles Salon at Home Depot Square in Bethesda! There will be a live DJ, drinks, makeup applications, seated massages and more. You can call ahead at 301.767.9889 to schedule your free blowout appointment slot. But how awesome is it that this Saturday you can get pampered and hotted up for free? With a drink? Grab your friends. Give the kids to Dad. (Hey, he can take ’em to the Truck Touch in Bethesda! Or Frozen on Ice! And head to Bubbles Home Depot Square in Bethesda for the full-on Beyoncé treatment.